Jacksonville Jaguars quarterback Blake Bortles out-dueled the Indianapolis Colts’ Jacoby Brissett with relative ease on Sunday, securing the 30-10 win with two touchdowns and 309 yards through the air. Jaguars wide receiver Marqise Lee was Bortles’ go-to target, hauling in seven passes for a team-high 86 yards and one touchdown. Running back Leonard Fournette also did his part, as he rushed for 57 yards and one touchdown. With that, we give you our PFF-exclusive takeaways from the contest for each team. 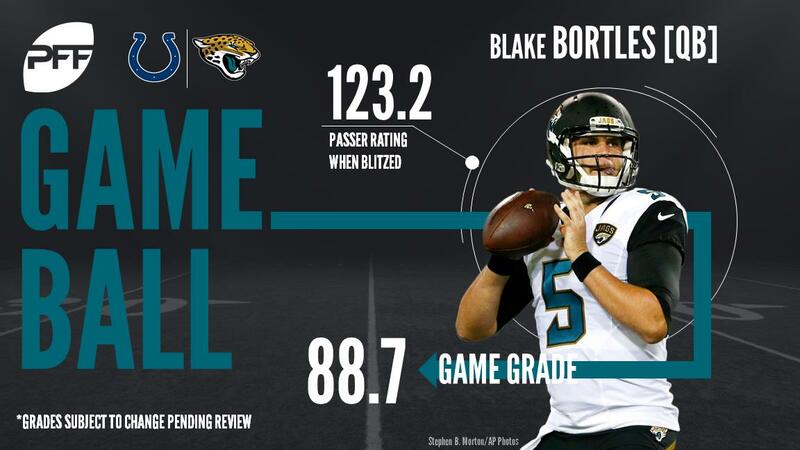 This was easily Bortles finest outing all season. He went 10-of-12 for 174 yards and two touchdowns on passes targeted 10-plus yards downfield. Both of his touchdown passes came when facing pressure as well. Lee has been up and down as the team’s top option with Hurns and Robinson sidelined. He lived up to his draft hype in this one though, hauling in seven of his nine targets for 86 yards. He added a scintillating one-handed grab on a post route as well. Gipson was targeted three times on the day and didn’t allow a single catch, while catching one himself. It was about as good a day in coverage as you can expect from a safety. It wasn’t all sunshine and rainbows for the Jaguars, as Colvin took this one on the chin. He allowed all six of his targets to be completed for 42 yards. He also missed multiple tackle opportunities in the flat. Brissett wasn’t the first quarterback to be chewed up by the Jags defense this season, nor will he be the last. Digging an early hole was about the worst thing that could happen for Indianapolis, as they were in obvious passing situations the entire second half. They had to employ chips on the edge nearly every play to give Brissett any chance of staying upright and he was still sacked four times. While much of the offensive line struggled, Person held his own. He was the only member not to allow a pressure and opened up a handful of holes in the ground game. It was a group effort to give up 300-plus passing yards, but Butler didn’t help much at safety, whiffing on multiple tackles to allow more yards after the catch. Sheard was the lone bright spot for the Colts defense. Sheard accounted for four of the Colts 13 total pressures on the day.